It has been an interesting year, and an interesting life, for Michael Malone. He grew up around the game, the son of a coach, but he nearly ditched basketball to become a state trooper in Michigan before a phone call changed his life. He was an assistant on teams with LeBron and Stephen Curry before the Kings gave him his first shot as a head coach. Sacramento shockingly fired Malone last December, after the team slumped without DeMarcus Cousins, and the Nuggets hired him to repair a team that had come undone under Brian Shaw. Malone talked to Grantland at summer league in Las Vegas about leaving Boogie, Denver’s future, playing 4-on-5, and more. You left one weird situation in Sacramento for another one in Denver — a team that canceled shootarounds because too many players liked to party. Did you do some due diligence, and have any second thoughts about what you were getting into? Obviously, you ask questions. But it’s kinda like when I went to Sacramento. I heard all this stuff about DeMarcus Cousins. I went in there with a clean slate, and didn’t hold anything against him. I’m doing the same thing in Denver. Whatever happened before I got there was not on my watch. This is a change for me to come and change that culture. Have you talked to Ty Lawson since his recent arrest on suspicion of DUI? Yeah. I’ve reached out, but there hasn’t been a lot of contact. He has a lot going on right now. We’re gonna see how this whole process shakes out. Do you expect him to play at the start of the season? Of course. If that changes, you go from there. But as of now, Ty Lawson is part of the Denver Nugget family. Would you ever cancel shootarounds? If I’m coaching a veteran team that’s won a couple of championships, then I’d consider it. When I was in Cleveland with LeBron, he’d say, “San Antonio doesn’t have shootarounds!” And I’d say, “Well, they’ve got championships.” I came in with Jeff Van Gundy in New York. I believe in preparation. I don’t see canceling shootarounds. There are no shortcuts to success. To what extent do you even involve yourself in the nightlife of players? Do you monitor them? Is it your job to tell them, as adults, “Don’t be out too late”? You hope you are coaching adults. This isn’t college, with bed checks. You hope you have pros on your team, who understand the importance of eating right and getting the proper amount of rest. If it becomes a problem, where it’s obvious guys are burning the candle at both ends, you may have to step in. Almost every Nuggets big-man combination with Kenneth Faried, maybe except for Faried–Timofey Mozgov, has been bad on defense. Can you find a lineup type with him that can grow into a top-10 defense? It’s a great question. When I got the job, I mentioned the team in 2008-09 that made the conference finals. That was a team that was eighth in defensive efficiency. They defended and ran. That’s a model I’d like to use: defend, run, and use the altitude. In regard to Kenneth, he has a great motor. But I need Kenneth to buy in on defense. They’ve gotten away from that the past two seasons. They still run, but they’re not defending. He’s one of those guys who runs much harder from defense to offense than the other way around, right? I made that exact point to DeMarcus when I got the Sacramento job. It’s the same thing in Denver with Kenneth. I’ll take it a step further: We have a great offensive rebounding team in Denver, but we’re a poor defensive rebounding team. There’s the reward of points on offense. Defense is the dirty work. If you want to run, you have to rebound first. Now, what kind of player do you put next to Kenneth? You need size and shot-blocking. They’ve had a bunch of centers — JaVale McGee, Mozgov, [Kosta] Koufos, J.J. Hickson. We’ll figure it out. DeMarcus was never known as a defender, but he made great strides to become the anchor of our defense. Have you thought about pick-and-roll schemes you might use with him — like if you want to drop back, or switch, or have him trap a lot? He’s fast, but he’s never struck me as the most intuitive defender. That’s a good word — intuitive. What we’ve always done is, with our power forwards, be more aggressive, and with our centers, drop back a bit. You always have the blitzes in your pocket in case a guy really gets going. But Kenneth is so athletic, with great feet. Maybe you can even switch a lot. You want these versatile players now, these Draymond Greens, that can switch and guard every position. Faried does come to mind when you think of big men who at least have the speed to switch like Draymond. But does he have the feel? Obviously, Draymond is different. But what Kenneth has, you can’t teach. He has that motor. That’s why he’s made it in the NBA. Now, we just have to make sure he’s playing with that same motor on defense. What do you think of Jusuf Nurkic? He’s a great talent. He reminds me a lot of DeMarcus in a lot of ways: how he carries himself, the personality, the skill set, great hands. He’s not a great athlete, but he’s really skilled. You preempted my next question: He’s obviously way less accomplished than DeMarcus, but does he remind you of him at all — just in the way that he can overpower pretty much anyone and move them under the rim? He sure can. There are not many great back-to-the-basket players anymore. I got criticized about playing slow in Sacramento. Well, guess what. We had the best low-post player in the NBA. We led the NBA in free throw attempts because we played inside-out. Has Nurkic taught you the Bosnian curse words yet? I know ’em all, man. I’ve been in the league 15 years. I’ve been around the Serbs, Croats, the Bosnians. Our summer league team is like the European Union. I changed my name to Malonivich, so I could fit in. There’s a YouTube clip of Nurkic blocking a shot, and then Faried running up to him, screaming the Bosnian version of “EFF-YOU.” It was great. Oh, I have to check that out. The story goes that you won over Cousins by praising him publicly — “he’s our All-Star, he’s an All-NBA player” — but getting on him hard in practice. Is that true? I don’t believe in throwing players under the bus. Some coaches will coach through the media. I don’t believe in that. I’m gonna protect our guys. But in practice, and in meetings, if you’re not doing what you’re supposed to be doing, I’m gonna let you know it. DeMarcus and I are similar. He’s a big African American guy from deep down south, and I’m a skinny Irish guy from New York City. But we had the same makeup. We’re very competitive. We hated to lose. When things weren’t going right, I wasn’t afraid to get on him. The stories of DeMarcus’s practice tantrums are legendary. Were you ever worried that things might go too far? No. I have to be who I am. When people ask DeMarcus about me, I think the things he respected about me was that I was always honest. If you’re dishonest, you’re done. You’re out. I never tried to B.S. him. I was real. If he messed up, I got on him. If he did good things, I praised him. I believed in him. That relationship was constant work. Constant. But we came to a deep respect. Were you ever actually approached about playing 4-on-5? [Laughs.] It came up. I was approached. I’m a defensive guy, and I know you can’t defend well if you only have four guys out there. You started 9-6, DeMarcus got sick, you started losing, and then you got fired. Did that surprise you? When the season started well, did you allow yourself to think you might have found a long-term job — a team that could grow together? When I got the job, it was a four-year plan: By the time we moved into the arena, we were gonna be a playoff team. I thought that was a great vision. I shared in that vision. Getting fired caught me off-guard. Being around the NBA my whole life, you understand security is not one of the pros of being a coach. But we had a team that bought in. That believed in me. And you saw, once I got fired, that team went into a tailspin. I felt awful for Ty Corbin. It was a lose-lose for him. But it just got out of control, and it validated the job that my staff and I did. I heard you spent a lot of time around the Wolves after you got fired. Were you and Flip Saunders always tight? We’re tight now. But I didn’t know Flip at all. He respected the fact that I had paid my dues, that I worked my way up. When I got fired, he reached out to me about a week later. He said, “I got fired before. I know everybody calls you. But a week later, you don’t hear from anybody.” I spent two different stints with Flip and the Wolves, and it was amazing. Just talking basketball. I’ll always be thankful for the opportunity he gave me. You almost became a cop. Why did that appeal to you? I played ball in college, and when I got out, I was working at Oakland University in Michigan. I wasn’t being paid, so I worked at Foot Locker. I was also working for a company that cleaned office buildings from midnight through 4 a.m. I said to myself, “I got a great education. I’m not being paid to coach. I’m tired of cleaning urinals.” I had always wanted to get into law enforcement. The Irish Catholic parts of New York City where I grew up had a lot of cops. I was on my way to becoming a state trooper in Michigan when Pete Gillen called me up and offered me a job at Providence College. Like, you were in the academy? Not yet. I was taking the written and physical exams. And now I look back, my wife was a volleyball player at Providence — I met her there. We have two beautiful daughters. The opportunity Pete gave me — who knows what would have happened in my life without that phone call. You majored in history. So did I. What was your specialty? I loved the Civil War era. I like Russian history. I worked at the University of Virginia, and on drives down, I stopped at Antietam. I’ve never been to Gettysburg. Garrett W. Ellwood/NBAE via Getty Images Malone with Emmanuel Mudiay. So, what was the draft room like when the Kings took Willie Cauley-Stein? Did you high-five and scream? Were you nervous they would take Emmanuel Mudiay? There were a lot of nerves. For us, the draft started with New York. We knew the top three, in whatever order they were going. When [the Knicks] took [Kristaps] Porzingis, we knew we were gonna get one of our top two guys. And the Kings took Cauley-Stein, and we had our choice. It’s very rare when you’re picking no. 7 to get the guy you target. 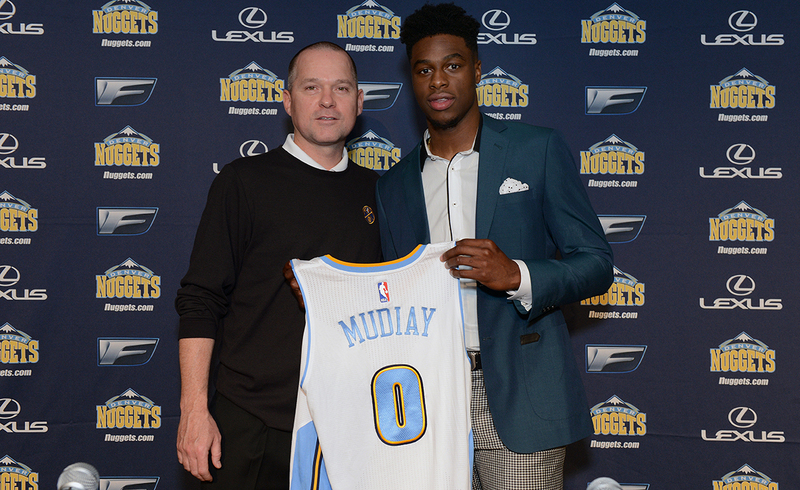 I kid you not, when I got the job, [general manager] Tim Connelly said, “Emmanuel Mudiay. That’s the guy.” We were in my hotel room just this afternoon, watching film together. Getting to know him, we feel we have a special young man. Who was the other guy? I assume you plan to play Ty and Mudiay together a bunch, if Ty is still on the team? Look at the game now, and look at the Finals. It’s no longer, “You’re a point guard, you’re a 2-guard.” You put your best players out there. Ty and Emmanuel can get wherever they want off the dribble, and Emmanuel is big enough to guard 2-guards on defense. I’ve never gotten a great answer on what, if anything, happened to LeBron in the 2010 series the Cavs lost to Boston. He put up numbers, but people thought he looked disengaged. There were rumblings of an elbow injury. You were there: What was your take? It’s a great question. LeBron made us look like pretty good coaches in Cleveland. We owe him a lot. Boston was our nemesis. We could never get past Boston. But that series, in 2010, I don’t know if it was an injury. A lot of people said he quit, mentally. Look, we won Game 3, took back home-court advantage, and went home for Game 5. We’re down six at halftime. I remember this so clearly. They come down, miss, offensive rebound, kickout 3 for Ray Allen. We’re down nine. They come down again, miss, offensive rebound, kick out, another Ray Allen 3.1 We’re down 12, series over. We never recovered. To be honest, I don’t know: Was it physical? Was it mental? Did he not believe? I’m not sure. And right after, obviously, he took his talents to South Beach. But over those five years, we were maybe the winningest team in the league, and LeBron made all that possible. Do you need to make the playoffs this season? Or is overhauling the culture enough? My goal is to get better every day. It sounds corny, but I believe it. During the lockout in 2011, I visited with Jim Harbaugh and the San Francisco 49ers, and he had a sign that said, “You’re either getting better or you’re getting worse. You never stay the same.” We’d love to make the playoffs, but it’s not playoffs or bust. We want to get our culture back and become a team that values defense. Could Mudiay start? You talk about him like he’s already a starter. He could. We’ll see what happens come training camp. But when you have a 6-5 point guard who makes everyone around him better, you’re gonna have a hard time keeping him off the floor. This is all exactly correct. Roster Doctor Mailbag: Is It Time to Give Up on Anthony Rendon?